Choose your input option between TYPE-I,TYPE-II,TYPE-III. For Type-1 Just click on the Click button. For Type-II Just click on the Click button. For Type-III Just click on the Click button. 1. TYPE-I takes sequence with '>'fasta tag along with ensemblID. 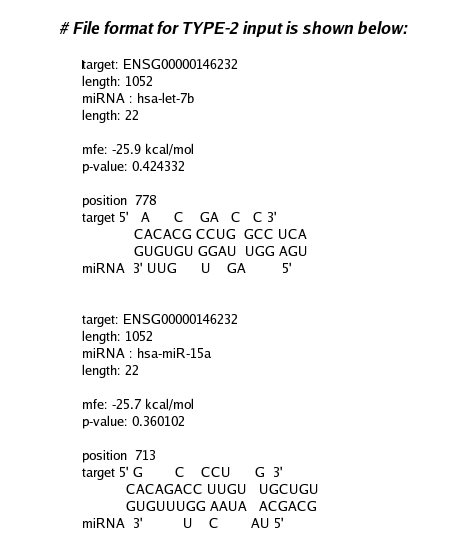 2.TYPE-II takes RNAhybrid output file. 3. Single query sequence should be Submitted. 4. While in TYPE-2 Single query sequence RNAhybrid output should be Submitted.